Eagle Point, OR - The Antelope Creek Bridge Built in 1922 originally spanned Antelope Creek some 10 miles southeast of Eagle Point. In August 1987, the structure was loaded onto a makeshift trailer and volunteers hauled it to the city of Eagle Point. When the bridge was rebuilt at the new site, arched openings were cut into each side so school children could be watched as they crossed the span. This alteration caused the bridge to be removed from the National Register of Historic Places. Since then, the bridge has been re-sided in a fashion that represents the original design. Now only ribbon openings appear under the eves. Sigh, we just lost our covered bridge during the Camp Fire. Lovely photo! Well done - a wonderful old bridge and well composted to show it off at it's best. Wonderful capture of this old bridge. Fine shot of an interesting subject ! Outstanding framing of this shot; wonderful contrasts and clarity! 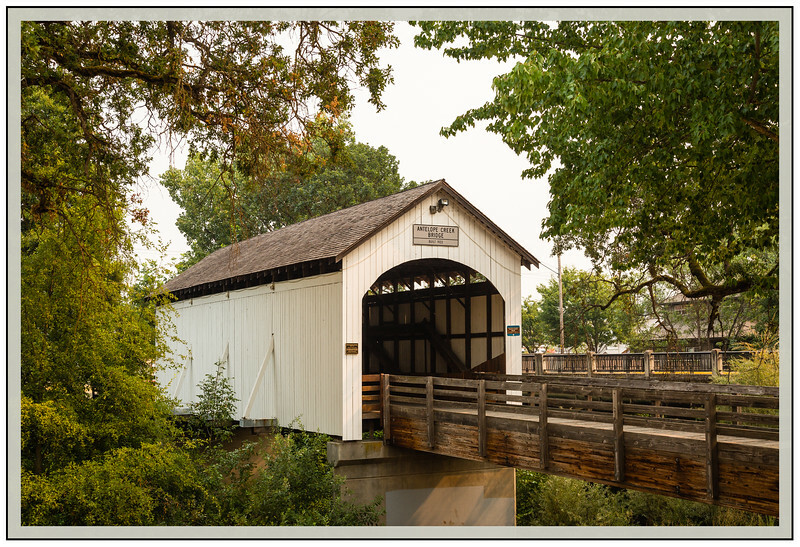 Another great Oregon covered bridge. Not having traveled in the midwest, Oregon is the only place I've run across this type of bridge. I always appreciate them when I find them.